Light with the Force! Light up the dark side of your room with forces from a galaxy far far away with this Star Wars Darth Vader Helmet 3D Nightlight. 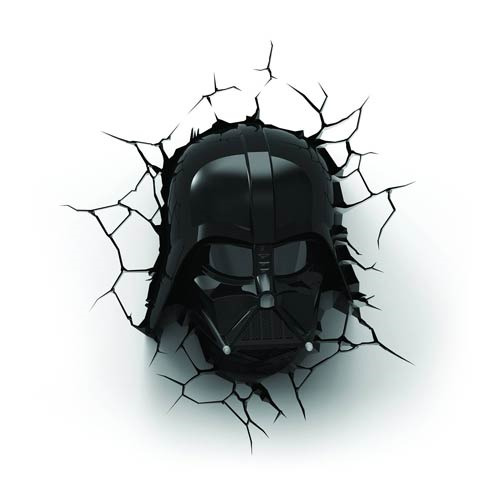 The Star Wars Darth Vader Helmet 3D Nightlight is battery operated and includes the 3D crack sticker to give the appearance that Darth Vader's Helmet has smashed through your wall. The Star Wars Darth Vader Helmet 3D Nightlight is battery operated by 3x "AA" batteries (sold separately) and uses LED bulbs. Includes 1 remote. For ages 12 and up.